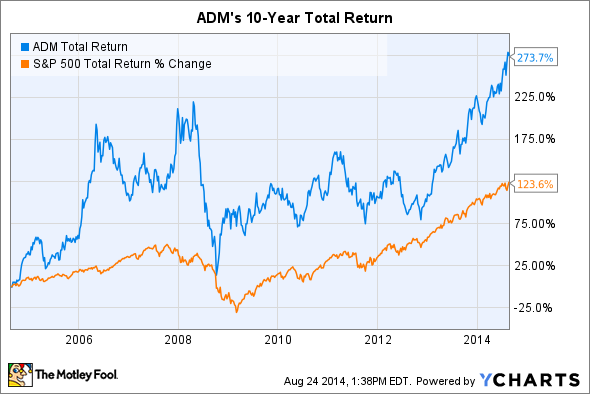 A few reasons Archer Daniels Midland's stock could fall in the coming months and years. Archer Daniels Midland (NYSE:ADM) has rewarded long-term investors by focusing on growing and diversifying its core business segments of oilseeds, agricultural services, and corn. Consider that just over 10 years ago the company had a limited presence in ethanol production. Once new national mandates were set, however, the company knew its vast agricultural raw materials gave it a distinct advantage over others looking to capitalize on the opportunity. Today, after years of investment and execution, Archer Daniels Midland enjoys the largest ethanol production capacity in the United States and captures over $7.3 billion from its operations. When dividends are included, the company's stock has outperformed the S&P 500 by 150%. While management is focused on continuing its run, investors know that stocks could fall or rise for any number of reasons. We recently considered three reasons Archer Daniels Midland's stock could rise, but today we'll look at three reasons the stock could head in the opposite direction. The company's ethanol business accounted for 8% of total revenue in 2012 -- and for good reason. There's a consistent demand for the alcohol fuel as a blendstock in the nation's gasoline supply, which replaces nearly 10% of the volume of the petroleum-based fuel. However, while some see first-generation ethanol reaching its saturation point, others see it beginning its inevitable decline. Archer Daniels Midland's investments in efficiency have kept its fleet of first-generation ethanol production facilities well positioned overall, but they will eventually require additional costly investments and retrofits. Archer Daniels Midland will need to consider three types of investments and retrofits if it wants to combat the volatility of the ethanol industry and extract even more value from its agricultural raw materials. The first is to convert its first-generation ethanol production to second-generation cellulosic ethanol production, but the complex processes required wouldn't make for a simple retrofit. The second is to convert facilities to produce more energy-dense alcohols such as butanol, which could be performed with a relatively simple retrofit and allow the company to tap into diverse markets such as polymers, commodity chemicals, and rubbers. However, it will have to partner with one of the handful of companies owning the technologies surrounding butanol production, thus reducing its bargaining power. The third is to convert existing facilities to next-generation industrial biotech platforms. A similar experiment is already under way at the Clinton, Iowa, production facility, although it was never an ethanol manufacturing plant. The retrofits would also be relatively costly and may not enable the same margins as a newly constructed facility, although the production of higher value products would be enabled for long-term value creation. Either way, it won't be so easy to divest from first-generation ethanol production. Archer Daniels Midland owns 26 processing plants for cocoa beans that sport 1.825 million metric tons of capacity, or roughly 38% of the world's processing capacity. Despite being a market leader in such an important and fast-growing global industry, the company has struggled to maintain a profit. In 2013 the segment raked in $3.28 billion, representing 9.4% of total Oilseed Processing revenue but registered a loss of $33 million -- the only one of the company's segments to finish the year in the red. Cocoa beans shown drying in South America, where ADM has two processing facilities. Source: pipeafcr/ Wikimedia Commons. Things are faring slightly better in 2014, with first half revenue weighing in at $1.6 billion and operating profits of $25 million, but cocoa processing remains a challenging business for Archer Daniels Midland. The company was in talks to sell its cocoa assets to rival Cargill but decided instead to ride out the volatility and invest in more efficient operations where possible. It may not contribute much to the overall business -- just under 4% of the top line -- but processing cocoa continues to place a heavy burden on shareholders. Wielding the vast transportation and logistical networks needed to efficiently shuffle renewable products around the globe is a powerful advantage for Archer Daniels Midland, but it's still at the mercy of commodity markets and the volatile prices that come with them. Investors should be pleased with management's focus on higher-value products such as flavors, specialty ingredients, and renewable oils, but it will take time for the company's current raw materials focus to evolve into and grow those businesses. That means investors will be stuck with low margins for the considerable future. Of course, that's not a problem when prices support profits, but in the event of a major economic downturn or agricultural catastrophe, Archer Daniels Midland could become unprofitable. Consider that the business generated over $89.8 billion in sales in 2013 but only $1.8 billion in operating income. That's a companywide operating profit margin of just 2%. There are numerous opportunities and risks facing any business. For Archer Daniels Midland, the path to higher-value, more diverse, and higher-margin products and businesses is well within reach. However, multiple obstacles such as high investment and retrofit costs for its ethanol production fleet, a challenging cocoa business, and the risks that come with living in a commodity-based industry could make the road to value creation a little bumpier than investors expect. Will these be the reasons Archer Daniels Midland Company's stock falls?